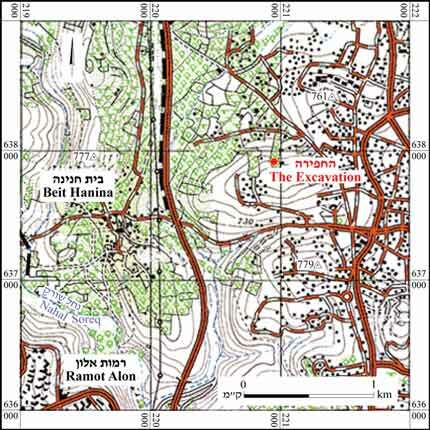 In November 2013, a salvage excavation was conducted in the Beit Hanina neighborhood of Jerusalem (Permit No. A-6934; map ref. 220997–1014/637850–65), prior to construction. 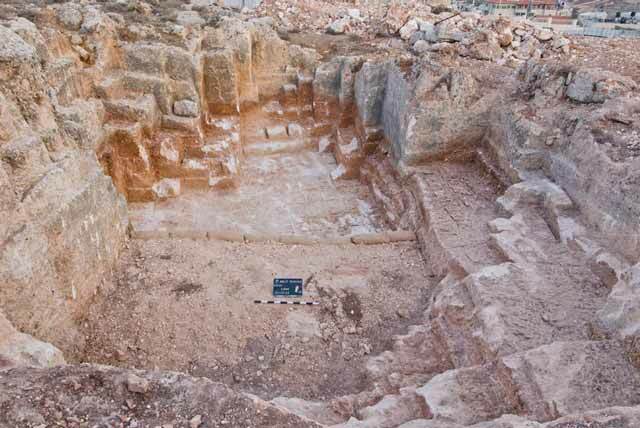 The excavation, undertaken on behalf of the Israel Antiquities Authority and financed by ‘Afna Jozeph, was directed by D. Yeger, with the assistance of N. Nahama (administration), A. Hajian (surveying and drafting), A. Peretz (field photography) and B. Touri. 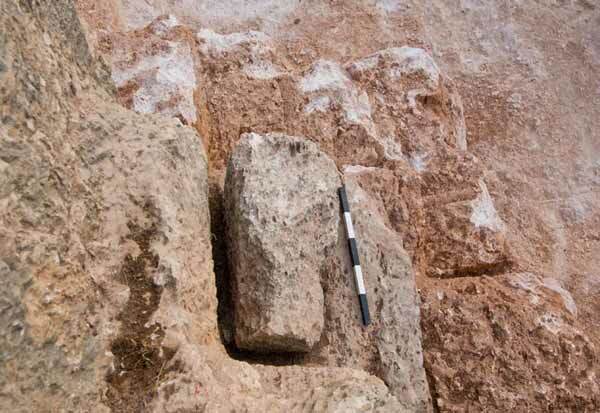 The excavation was conducted on the street north of and parallel to al-Bironi Street, along the northern slope of a hill north of ‘Abd al-Hamid Shoman Street. It was bounded on the east and north by Bir Naballah Road and on the west by Highway 50 (Fig. 1). 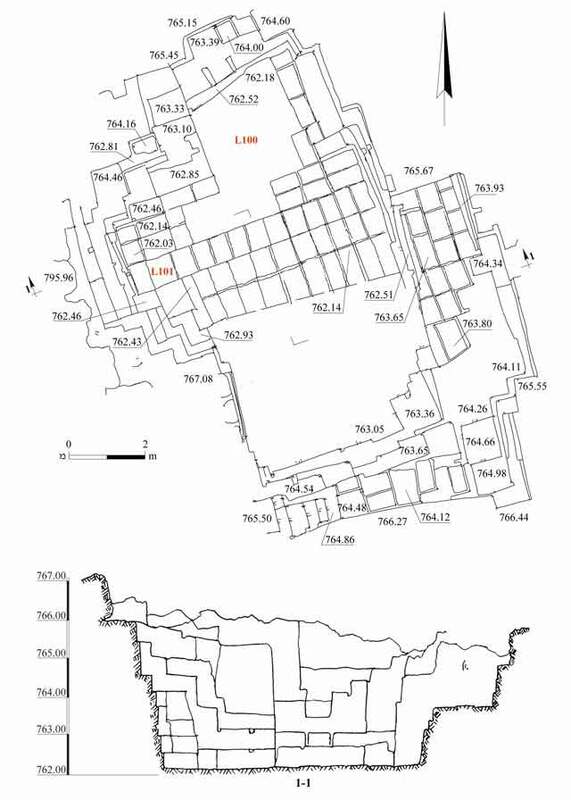 In the past, numerous ancient quarries were surveyed and excavated in the region (Kloner 2001: Sites 27, 75, 116; ‘Adawi 2009: Sites 1, 2, 7, 9–12, 14–19), several of which were dated to the Roman and Byzantine periods (‘Adawi 2007; Mizrachi 2008a; Mizrachi 2008b; Zilberbod 2012). These constituted part of a series of quarries on the Shu‘fat—Beit Hanina ridge that was used throughout the ages. Two ancient Roman road—Nablus Road and Bet Horon road—that led to Jerusalem run along the top of the ridge (Kloner 2001: Site 28). These roads enabled the efficient transportation of building stones to Jerusalem as well as to settlements in the vicinity of the quarries. Prior to the current excavation, trial trenches were dug in order to expose and evaluate the scope and size of the ancient quarry. Modern debris and alluvial accumulations were removed by means of mechanical equipment down to the archeological layer, characterized by quarrying chips. A very deep, medium-sized courtyard-type quarry (9.7 × 13.7 m, max. depth 3.8 m; Fig. 2; Safrai and Sasson 2001:4) was excavated. The stones produced were all of similar size (average dimensions 0.36 × 0.36–0.60 × 0.60 m). The severance channels (upper width 0.10–0.13 m, lower width 0.03–0.04 m; Figs. 3, 4) had a trapezoidal-shaped cross-section. Their dimensions corresponded to those of the stones that had been hewn in the quarry but were not detached. Diagonal chisel marks (width 1–2 cm, depth 0.5 cm; Fig. 5) were visible on the walls of the quarry. The quarry had straight walls on its western side; there were eight quarrying steps in its eastern and southern parts that descended toward the center of the quarry. 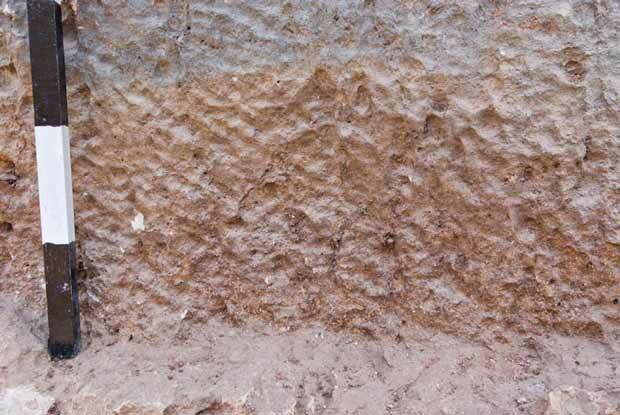 Two layers of accumulation were evident: an upper layer of dark brown alluvium (depth 0.5–1.0 m), and below that a layer of quarrying debris composed of light brown sediment and many white limestone chips (average size 2–7 × 5–10 cm). The debris layer extended down to the quarry’s floor (L100), upon which were compacted calcareous encrustations. The quarrying chips became smaller towards the floor, where they were extremely small (average size 1 × 2 cm). 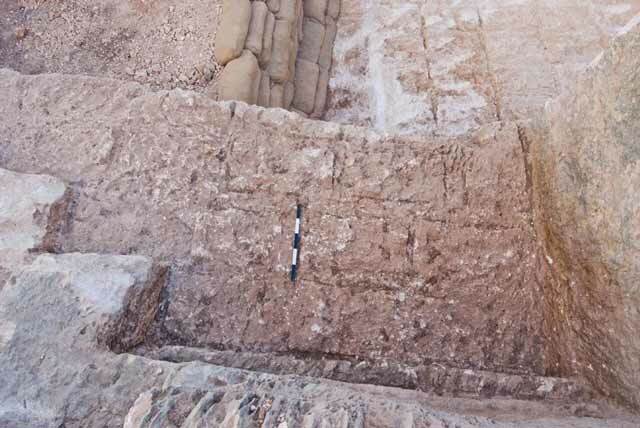 These layers were removed by mechanical equipment except for one square (L101; 4 sq m), in the western side, that was manually excavated. Only the northern half of the quarry was excavated (Fig. 6). The ceramic finds were scant and could not be dated. The method of producing stones and the outline of the quarry indicate knowledge, prior planning and organization which permitted several groups of laborers to work simultaneously. Normally it is difficult to date quarries because the techniques employed in rock-cutting were similar in every period (Safrai and Sasson 2002:2). This quarry and the others that were excavated and surveyed in the region were meant to supply building stones to Jerusalem and possibly also to other sites in the city’s northern outskirts near the quarries, such as Khirbet Hawanit, Khirbet Magharam and Kh. ‘Addasa (‘Adawi 2007). Despite the meager finds, this quarry can be associated with the adjacent quarries that were dated to the Roman and Byzantine periods (second–sixth centuries CE). Mizrachi Y. 2008a. Jerusalem, Shikune Nusseiba. HA-ESI 120. Mizrachi Y. 2008b. Jerusalem, Shikune Nusseiba. HA-ESI 120. Zilberbod I. 2012. Jerusalem, Beit Hanina. HA-ESI 124. 3. A stone prior to detachment, looking east. 4. Negatives of severance channels and stones that were detached from the bottom of the quarry, looking west. 5. Chisel marks, looking east. 6. The quarry, looking north.